Simogo‘s Bumpy Road [$2.99] is radical because it totally embraces the touch screen. 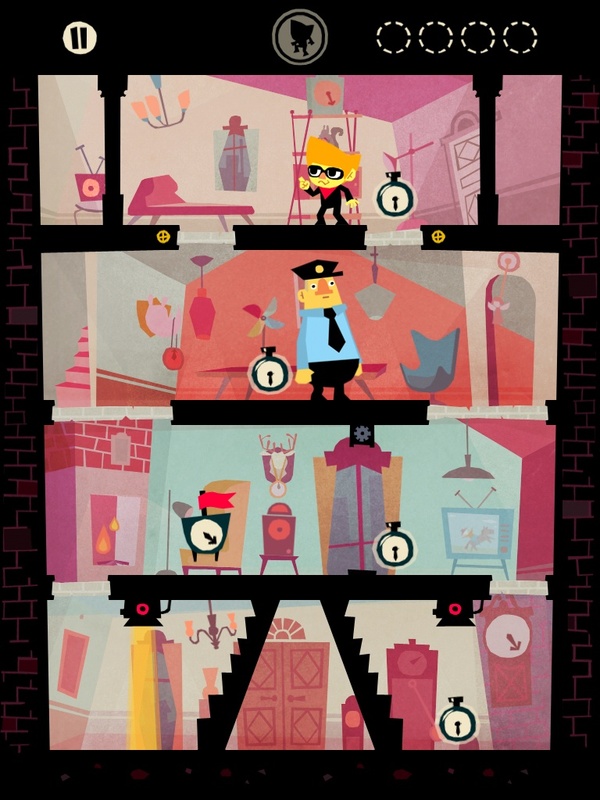 On top of being a simple and gorgeous game, the play is stupendously clever. Touch the physics-enabled bit of road and it lifts, taking the playful car with it. This purity of design might become something of a hallmark for the Swedish company. 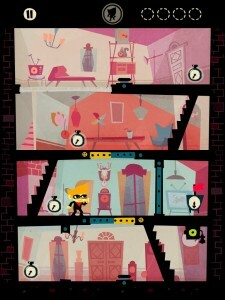 I’ve just spent some time with its upcoming title, Beat Sneak Bandit. It’s as artful and as delightfully cutesy as Bumpy Road, and it boasts another kind of one-touch control that feels just as satisfying. Color me impressed. Beat Sneak is a little abstract conceptually. I’ve started to think about it like this: it is what would happen if Kojima decided to marry 2D Metal Gear Solid to Grove Coaster [$.99], and knock out all of the former series’ fat in the process. 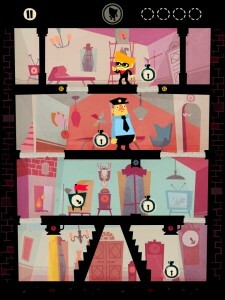 In Beat Sneak, you control a bandit (duh) on a 2D plane in tightly constructed, object–filled vertical levels. Your goal is pretty basic: steal a huge clock without security systems or people detecting your presence. What makes this interesting is the injection of puzzle mechanics and the game’s unusual control method. You move lockstep, but only if you tap correctly to the level’s beat. If you played Groove Coaster, imagine a scenario in which you were only able to access the next note if you correctly hit the previous one. This is how you move in the world. Moving is simple, but devilish in practice: in addition to having to keep the beat, you’ll need to avoid pitfalls — sliding doors, strobing searchlights and other kinds of bandit-catching obstacles. In the game’s first chapter, a lot of the mainline puzzle solutions can be boiled down to knowing when to wait for an opportunity to open. This is roughly the equivalent of resuming a Rock Band song midway through, so it ain’t easy. Another thing: there are other, smaller clocks in levels. If you’re into optionals, you can grab these, too, but they require serious thought. You’ll need to observe movement patterns at every turn, evaluate the best way to turn Beat Sneak the Character around, and then get him back to the main prize — all without being caught. In my demo session, I played through the entirety of the first chapter in the game and that took around 30 minutes. I failed a lot because I’m no music game master, but I also failed because the optional clocks are flat-out hard to obtain. I also noticed while I was doing all this failing, by the way, that there is a baby mode “skip" option that’ll whisk you away into the next level with no penalty. Not even a tutu. I think the biggest challenge facing Simogo is keeping players feeling the groove and in the moment as they ponder and then experiment with the environment. Music games are odd beasts in general, as the experience tends to snowball into an icky mess if you fumble the timing of a song. 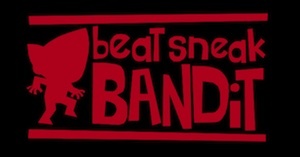 Speaking of that, Beat Sneak‘s quirky music is fantastic. I also dig how the entire game seems to revolve around the beats and the general offbeat tone. In the trailer, you’ll see how the bubbly world bobs and weaves with the music. I’m overwhelmed by this idea. Conceptually, Beat Sneak is cool, and the execution on the remarkably pure concept seems to be panning out extremely well. We’ll get our hands on a final version a little later this quarter when the game hits iOS.